From the cross—continental design studios of award—winning Maggie Sottero in Sydney, Australia and Salt Lake City, Utah, the stunning fashion label Sottero and Midgley was born. Sottero and Midgley collections reflect the multi—generational design talent within the Maggie Sottero family, showcasing inspiration curated from an international landscape and styles patterned with artistry by seasoned experts. Sottero and Midgley Brides not only experience exceptionally crafted, innovative designs, but luxurious fabrics, Swarovski crystals, hand—sewn embellishments and a renowned, slenderizing fit, the result of meticulous attention to, and scrutiny of, design and fitting details. As unique as the bride who wears it, Sottero and Midgley offers sophisticated brides an affordable couture experience of the highest quality in fashion forward designs. Special Pricing. By Appointment. Trends are ever changing, but Boutique De Voile is dedicated to fulfilling each bride’s individual vision for her special day. 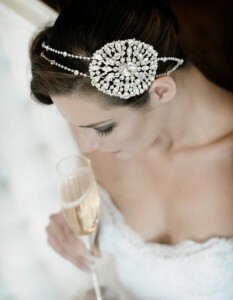 Their custom-made wedding veils, tiaras, headpieces and hair jewelry are unique, gorgeous finishing touches for your big day. Special Pricing. By Appointment. Award-winning bridal designer Eve Muscio creates all of her gowns using the finest fabrics from different parts of the world and is most widely known for her incomparable designs of embroideries and laces. 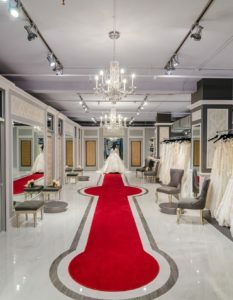 Her gowns have a unique signature look that fit to perfection no matter what size, “I love all the brides that choose my gowns to feel an absolutely magical experience. I feel proud to be such an important part of their wedding day. Special Pricing. By Appointment. Ethereal romance, youthful exuberance, vintage inspired embroidery and modern silhouettes resonate the essence of The Ashley & Justin Bride! This wedding dress brand illuminates intricate laces and embroideries, whimsical appliques, dazzling details and masterful tailoring that we combined to create a thoughtful and feminine collection. It’s designed for every type of bride, whether you love the simplicity of an A-line or the elaborate craftsmanship of a ball gown. Special Pricing. By Appointment. All bridal and evening wear featured in the sale is $250 cash and carry. We will have a selection of veils as well! Curvy sizes available. A perfect opportunity to shop for a second dress as well.